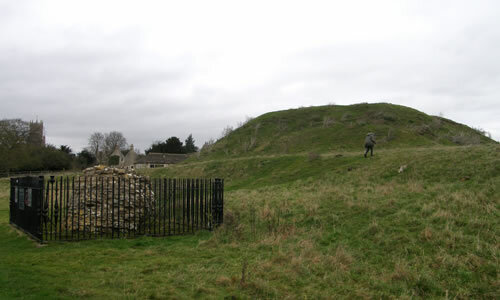 Fotheringhay Castle is a late 11th century earthwork motte and bailey fortress, founded by Simon de Senlis. His widow, Maud, married King David I and the castle passed down the Scottish royal line, until forfeited to the English Crown in 1294. Granted to Edmund of Langley in 1377, he largely rebuilt it and later it became a royal palace of the Dukes of York. The irregular, flattened top of the motte, indicates the remains of the D-shaped polygonal donjon. Inside the inner bailey rampart and ditch, are the covered foundations of a great hall and domestic ranges. A large ditched outer bailey, once guarded by a gatehouse and the Great Pond, curves northwards from the bridge to the mill stream. The castle which remained a royal possession until 1603, was the birthplace of King Richard III in 1452 and the place of execution for Mary, Queen of Scots in 1587. Completely dismantled in 1628, it's stone and timber was used to build the Talbot Inn in Oundle. 12 miles east at Peterborough is Tout Hill and 14 miles west is Rockingham Castle. Fotheringhay Castle is located in the village centre, by the bridge over the River Nene. 12 miles west of Peterborough, on the A1139-A605. The site is freely accessible in daylight hours, a public footpath passes the castle, from Castle Farm Guest House.